From mildly spiced vegetarian options to varieties prepared with shrimp or even brisket, the pho selection in Washington State is top notch. For noodle lovers everywhere, we’ve provided the best places in the state that offer this delicious soup. Here are our favorites. With the unique blend of Chinese, Vietnamese, and Thai cultures, Best of Pho offers just that—the best of pho in the Marysville, Washington area. A hit with people who come to the restaurant from other areas where pho is a staple, hungry diners can find large portions of the delicious steaming rice noodle soup with tofu and straw mushrooms, chicken, meatballs, shrimp, steak or brisket, tripe, or just vegetables. The mark of a good pho is the quality of the noodles and the broth, but Best of Pho even goes beyond that with the freshest basil, sprouts, jalapenos, and other accoutrements. You can get your pho on any day of the week. If you love all things noodles, you have to stop and try the pho bowls at Pho Big Bowls. Located in downtown Seattle, this Vietnamese restaurant serves one of the best vegetarian pho in the neighborhood, although there are no complaints about the other varieties. You’ll enjoy your favorite take on this popular rice noodle soup in a relaxed and comfortable environment that’s family friendly and reasonably priced. Next time you’re in the area or because you’re on a search to find great pho, Pho Big Bowl has big taste that shouldn’t be missed. Don’t let the small size fool you. Rose Pho is big on taste and everything else. Serving authentic Vietnamese and Asian fare, this Normandy Park restaurant delights in exposing the general public to unfamiliar cuisine. With over 80 traditionally-inspired menu items, the pho is the most popular and comes in a variety of flavors to match your taste preference. You can build the intensity of heat with jalapenos, hot oil, and other sauces to accommodate the level you want. Open every day with happy hour on Mondays through Fridays from 3 p.m. until 5 p.m.
You can start off with the spring rolls or avocado eggrolls and go from there at one of the most unforgettable places for all things Vietnamese. There are so many great things to try, but considering the name, UnPhogettable, you’ll definitely want to try the one of the aromatic rice noodle dishes with steak, brisket, meatball, chicken, or a combination at this small North Bend, Washington, restaurant. Rich and with a deep flavorful broth, one taste and you’ll understand why they chose the name. Open every day but Monday for a truly unforgettable experience. The food at Pho King Crab in Union Gap, Washington, is so popular, they had to enlarge the size of the restaurant. If you like oodles of noodles, you’ll love the pho here with the large platter of bean sprouts, lime wedges, jalapenos, lettuce, and fresh basil. And you have to have a frosty cold glass of bubble tea with your lunch or dinner serving. What goes better with a steaming bowl of pho than bubble tea? At Pho Bubble Team in Bellingham, Washington, you can choose from over 20 of flavors of the popular creamy fruit drink with large tapioca pearls to go with the best Vietnamese rice noodle soup in regular, large, and extra-large portions with steak, meatballs, brisket, chicken, tripe, shrimp, or vegetables. You can even choose between two broths: sate or sweet and sour. You can dine-in, order ahead for pick-up, or have your food delivered to your doorstep. Pho Bubble Team is also a community-minded establishment, and will gladly donate 10 percent of your order to your favorite charity. Clean, fast, friendly service is what you’ll find at Good Pho You in Lynnwood, Washington. If you’re looking for all-around good Vietnamese and Thai food and the best pho in town, this is the place. If you’re a big fan of pho, they have a section of the menu dedicated to specialty pho flavors like seafood, ground peanut, and dumpling pho. Diner favorites include the fried rice, 30 flavors of bubble tea, and noodles. You can eat in the comfort of the modestly decorated restaurant in an unhurried atmosphere, or you can order in advance and pick it up for a great meal at home. Open every day. You don’t have to spend a lot to enjoy authentic and delicious Vietnamese food, especially when you dine at Pho Van in Spokane, Washington. Although everything on the menu sounds good, they’re known for having the best pho in town, so this is the place to come if you’re addicted to that savory noodle soup. You can satisfy your hunger and thirst every day of the week with traditional foods and catering to vegetarians and vegans is no problem. Family friendly and reasonable priced, Pho Van is a great place to come for lunch or dinner. The casual and cheery atmosphere that exists at Pho Yelm in Yelm, Washington isn’t the only thing that awaits you. The use of fresh herbs, spices, and other ingredients for the full list of menu items is compelling and once you eat there, you’ll wonder what took you so long. Free parking and doors that are open every day but Tuesday allow you to experience great food at reasonable prices served by friendly people. You can start with an appetizers and move to any one of several versions of pho that be as spicy as your palate can handle. Whether you’re new to Pho Viet Anh or a frequent diner, you can always count on great service, delicious food, and an experience worth remembering. 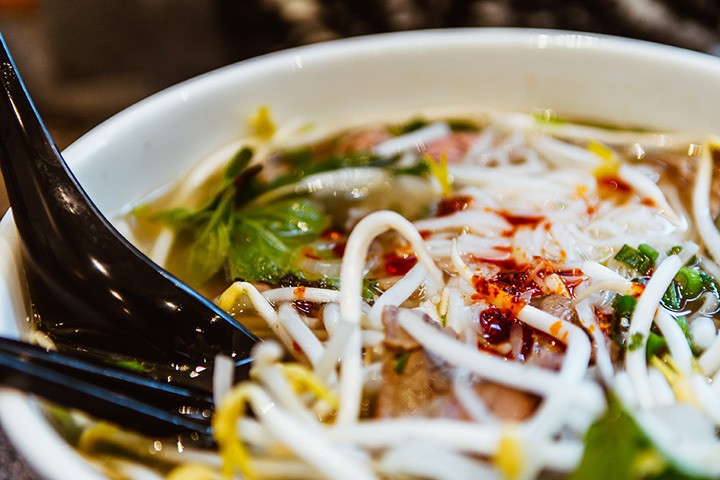 Located in Seattle, Washington, Pho Viet Anh uses only the best and freshest ingredients to create authentic Vietnamese cuisine that is full of flavor and not heavy like a lot of Asian. Light and refreshing, you’ll be amazed at the taste of all their dishes, but if you love pho, this is the place to get it. With many varieties available like steak, meatball, and brisket, there are other alternatives like chicken, tofu, shrimp, and a vegetable pho for those who prefer a plant-based lifestyle. Open every day.